Ask fellow campers about "Lewis Park" and nearby attractions. An address for Lewis Park that could work with your GPS is 14 Recreation Drive, Wheatland, WY. When you see the "Camping" sign, continue past it. The RV sites are on the left. They are back in sites. Each shares a pedestal with 2 power boxes with good 30/50 amp power. No water at the sites. When leaving there is a dump site with non potable water. You will face a lovely large treed grassy park with restrooms. They only ask for donations (at the sign). There are no reservations, just first come, first served. We arrived around noon. Of the 16 possible sites, we were the only ones there all day. None of the sites are really level, but they are manageable. Many are short for a 40' motorhome. We camped at Lewis Park in a Motorhome. Fort Laramie is in the area, but about 42 miles from Lewis Park. This is a city operated park and the sites are free for three nights. We had 50 amp service. There was one tenter and one RV there. It is near a railroad track and we heard 3 trains in a 16 hour period. Sites are fairly level and there is a nice are to walk dogs. There were also picnic tables at most sites and a place to load water. Local police drove through a couple of times. It was thoroughly satisfactory for an overnight stay. There is a donation box and we left $10 to encourage the city to continue this practice. We camped at Lewis Park in a Motorhome. OK, so we found this park on this site, which was great. There are about 15 sites in this city park. The park is very nice with lots of activities. The sites are right on the edge of the stream that runs through the park and it is well maintained. What you have read about leveling is true, it's very tough if you have a larger RV. When we arrived it was about 3:30 PM local time. There were about 6 others here then. They were not good neighbors. Most of the folks had their RV in a site and then blocked the site next to them with their car or truck. I took the last site and pulled in so I would not have to face the Bounder that clearly had not moved in many years. There was a woman it the Bounder that did not give me that safe feeling. The Bounder has broken windows, rotting tires, towels for window shades, a sewer hose running under it. This one RV and the occupants really degrade the place. Anyway, the power did not work on that site and I had to move. Got a site with a beat up car on it, had to put up with that. Then the bounder woman came with someone and they jumped it and moved it. I was lucky and got one of the four 50 amps plugs. Lots of people were using the park and the cops came about 7:30 PM and knocked on my door to inform me of movie night. All in all a nice place that is nicely kept, with just a couple issues. Will come back if in the area. We camped at Lewis Park in a Motorhome. Check out the bulletin board next to the donation pipe. It's got all the park sponsors. Surprising in this day and age to find a city park with free (donation) 50 amp power, water and a dump nearby. Our motorhome front weels were off the ground to get level. This park is beautifully manicured. There is a frisbee golf course, a basketball court, a playground, walking trails and a swimming pool within walking distance. Yes, there is a train nearby, but never heard it once during the night. There is a 3-day limit, but looked like there were some residents who have been there a bit longer. 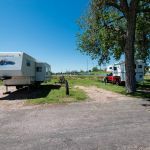 There seems to be an abundance of young people driving through and parking in the RV sites ...who knows what they are doing, they don't stay long. Night time was very peaceful. This place is ideal for the location and price! Easy satellite through the trees. Verizon worked well. We camped at Lewis Park in a Motorhome. 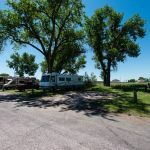 Check out nearby Grayrocks reservoir for some fantastic boondocking. A convenient overnight stop. Nothing more. The sites were not level but we had no problem leveling using our jacks. 30 amp electric stopped working during the night, but we were able to reconnect to the 20 amp outlet. The fresh water was fine and dump station easy access. Had fun running with dog on nicely mown grass. It is right next to railroad tracks and noise at night was unpleasant. We camped at Lewis Park in a Motorhome. The campsites are located within Lewis Park. The sites literally back up the bank of a stream/canal making leveling somewhat of a challenge. 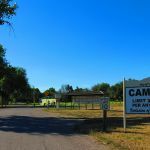 While the camp sites are basically gravel & weeds, Lewis Park itself is very nice with good walking paths, disc golf, horseshoe pits and small kids play areas. There were 2 other rigs when I pulled in around 3:30 pm, by 6pm at least 6 other rigs had arrived. I would use this park again. We camped at Lewis Park in a Motorhome. This is a city park that accepts donations. We were only here one night en route, but it was very quiet, easy to get into and we were happy to use the 50 amp hookups they had available. We camped at Lewis Park in a Fifth Wheel. Great place to stop for a day or a few. Officially, there is a three day limit. Cost is free but they ask for a donation, however the donation box was missing when we were here. Only 4 sites have 50 amp power; the rest are 30 amp. There is a small tenting area as well. No water hookups but there is a water station available to fill your tank. Dump station is also available. We stayed here in a big rig and would stop again. We camped at Lewis Park in a Motorhome. This park is in the middle of the city park complex. It is in the middle of the baseball fields, tennis courts and skate boarding park. The sites all have 30/50 amp. The water spigot is at the entrance to the park. The sites are wide with shade. No local TV channels but our satellite worked good. Our Verizon phones had 1XEV and 5 bars. Our Verizon aircard had good signal also. We will be here for a few days to check out the area. 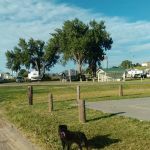 We camped at Lewis Park in a Fifth Wheel. This city park has first come first served sites, all back-in, with 30 amp electric, water, and dump across 8th street. Donation. 3-day limit. I-25 exit 78, go east 1 block to 16 St. Turn south 1 block to Cole Rd, then east 8 blocks to 8th St, then north, 2 blocks to County Park on left. Nearby RxR but trains infrequent. Playground, swimming pool, etc. adjacent. Large Cottonwood trees. Good cell service, most sites open to south for sat/solar. Wi-Fi at Library. We camped at Lewis Park in a Motorhome. Are you affiliated with Lewis Park ?